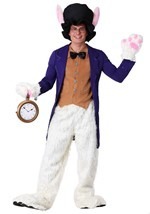 Transform yourself into the famous white rabbit with this jumbo bunny accessory kit. The jumbo paws with pink pads measure 14" across and 11" tall. The perky bunny ears measure 7 1/2" tall and the cute pin on bunny tail can be pinned to your outfit with ease. You won't have to worry about being late for your very important date with this quick and easy bunny kit!